Good psychic guidance is an art. Don't settle for a forgery. The idea of "consulting a psychic" can run the gamut-from throwing yourself on the mercy of scam artists to sitting with someone who knows everything about you without your saying a word. Corbie Mideid has seen them all-the rip-offs, the truth-tellers, and the workaday psychics who may not have marquee names but are skilled and valuable nonetheless. A professional psychic medium herself since 1994, Corbie has experienced clients from every angle: Rookies. Seasoned co-creators. Skeptics. And she's dealt with the desperate, the delusional, and the ones who think psychics are a shortcut to gaining their heart's desires without lifting a finger for themselves. "If you want to avoid getting lost on the Road to Self-Knowledge, this is your guidebook: sharp, clear, and full of practical information for those who are intrigued by the idea of using psychic guidance, but have no idea where to start. 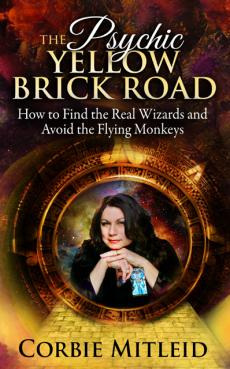 You'll be a savvier client by reading The Psychic Yellow Brick Road. You'll understand how to choose a quality psychic, and you'll be better prepared to recognize a good readingfrom a poor one-or even a downright scam. Moreover, many of your questions about psychic and medium abilities, spirits and spirit communication will be answered here. I loved the author's insight, clarity of thought, and her writing style (with a natural humor that had me smiling throughout the entire book)." Bob Olson | Author of Answers About The Afterlife and host of AfterlifeTV.com.